I had the ladies over this morning to watch the premiere of The Pioneer Woman's new Food Network show. 'The Ladies' = Bev of BevCooks and Cassie of Bake Your Day. Coincidentally, 'The Ladies' and I are making the drive from KC to Nashville together to attend Food Blog Forum in early October. We were practicing spending time together in small spaces. The premiere aired mid-morning, so we had a mini brunch complete with way too much french pressed coffee. Or, if you're Bev and our friend Carrie, you think scones are rock hard discs you'd rather use under the foot of a rocky table than even consider eating. I think I successfully left them with a much better impression of scones. Soft, light, airy. Not rock hard and cringe-inducing. 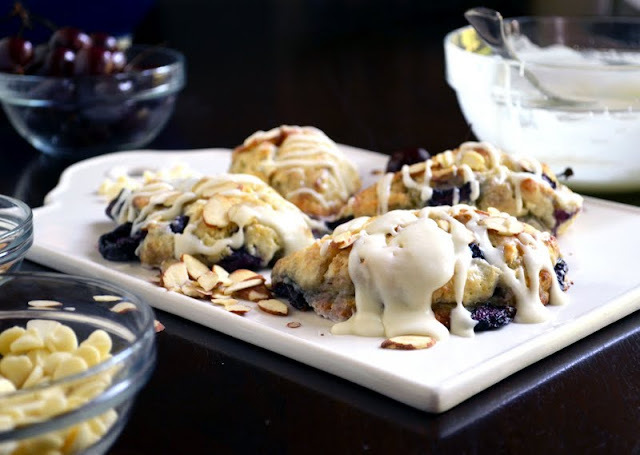 I originally wanted to make cranberry orange scones. And then it occurred to me that fresh cranberries were likely not in grocery stores yet. But I had hope. Hope for frozen cranberries at the very least. Hope found me scrambling on my iPhone in the grocery store at 8:15 this morning trying to come up with another flavor profile to add to my favorite scone base. NOTE: I dressed these little guys after the ladies left, so the glaze appears thicker than it would/should as the scones weren't still warm when these photos were snapped. They all come together beautifully in this scone. Stir together the dry ingredients: flour, baking powder, salt, and sugar. Using 2 forks or a pastry blender (or even your hands), cut in the butter to coat the pieces with the flour until the mixture resembles coarse meal or small peas. Stir the almond extract into the cream. Make a well in the center of the flour mixture and pour in the cream mixture. Fold everything together just to incorporate; do not overwork the dough. You may need to add an additional tablespoon or so of cream to ensure all of the flour is moistened. 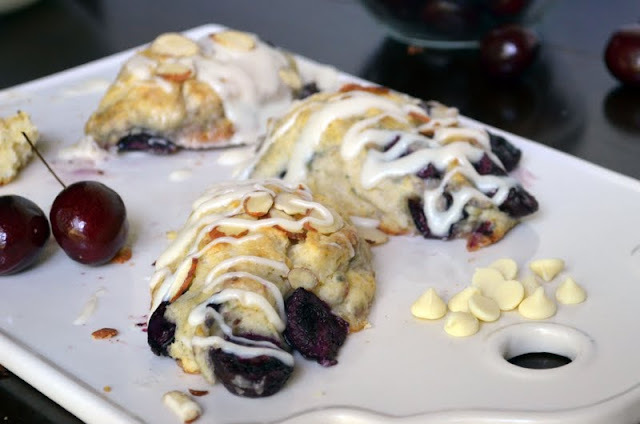 Fold the cherries into the dough. Hopefully they're nice and juicy, so they will bleed into the dough a little bit, which is just fine. Instead of pressing the dough into a circular mound and then cutting into 'slices' like a pizza, I use this method to achieve the classic triangular shape: press the dough out into what is essentially a cubed cylinder. Meaning, a long rectangle that is the same length high as it is deep. Cut in half lengthwise, then cut each half in half again (to ensure even cutting of the rectangle into quarters). You'll be left with 4 squares once you flip each 'slice' onto its side. Cut these squares in half on the diagonal to wind up with 8 triangular scones. Bake for 15 to 20 minutes until brown and allow to cool slightly before applying the glaze. Mix the milk and confectioners' sugar together in a microwave-safe bowl, stirring until the sugar dissolves. Add the butter and white chocolate chips (no need to stir). Nuke it for 30 seconds on high. 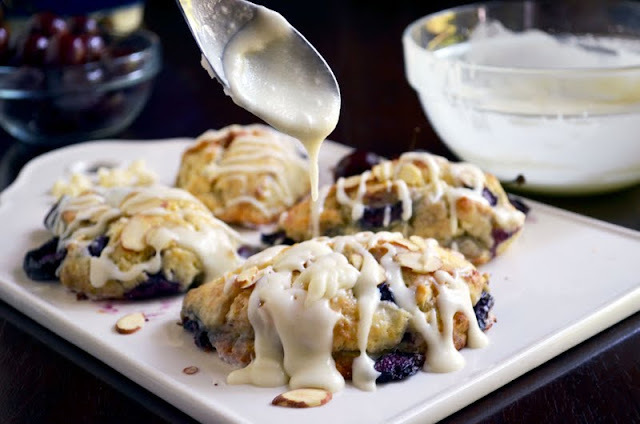 Whisk the glaze to incorporate the white chocolate and smooth out any lumps. Return to the microwave to fully melt the chips if needed. Drizzle the glaze over the top of the scones and allow to set a minute or two before serving. Love the post! I think we'll be just fine in small spaces. So looking forward to it! Had the BEST time with you ladies this morning, and uh, GREAT shots! This sounds like a great day!!! I can't believe I missed the Pioneer Woman's show today!!! What the heck was I doing?!?! ....KC to Nashville, jealous! You are going to have so.much.fun! OMG I HAVE to try these! The fam and I have been on such a huge cherry kick lately. You wouldn't happen to have a cherry pitter you could recommend would ya? 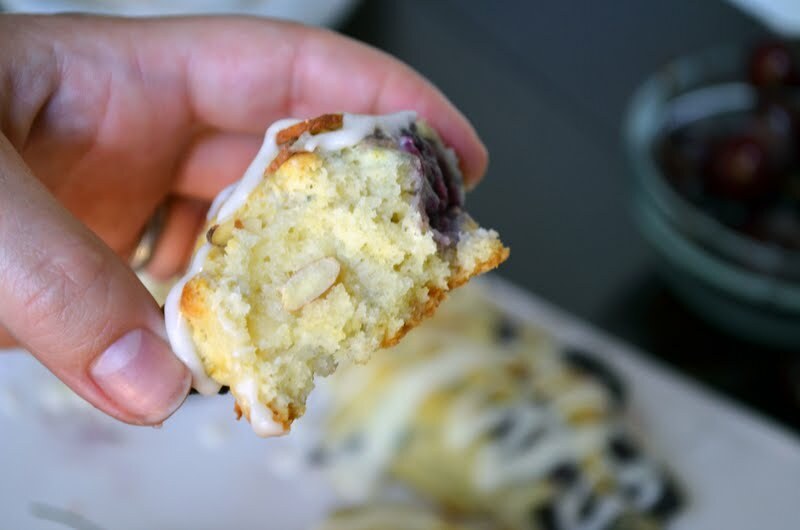 I was going to make this exact recipe today! 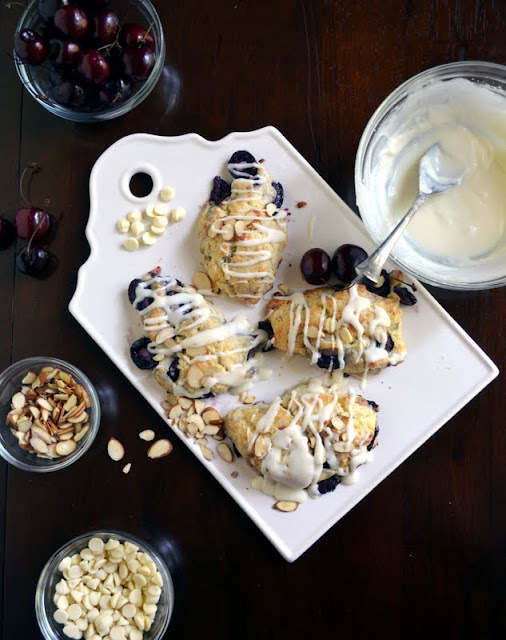 Cherry almond white chocolate scones! You beat me to the punch, girlie! Rats! @astooatthecounter: I don't use a cherry pitter. Just a paring knife - run it around the cherry to halve it, then remove the pit from one of the halves (similar to how you'd halve an avocado). what is T and t in this recipe? is it tablespoon or teaspoon? thanks.. Thanks for reading! 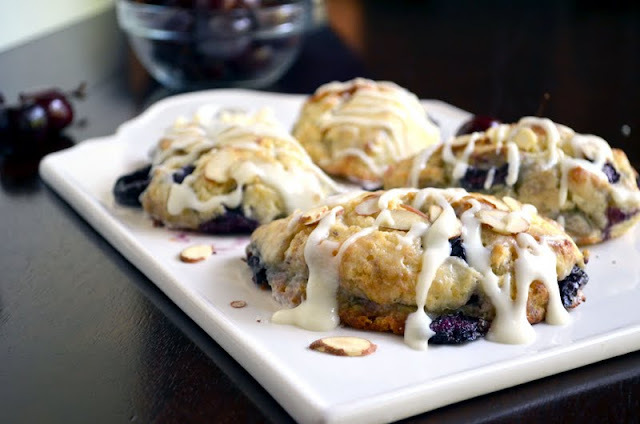 Hope you enjoy these scones.